KYMA can feel abstract modular for most people. Notice the sound....it sounds modular! Creating voices with use of formants. An excitation signal similar to a glottal pulse (with a randomly chosen rate of vibrato) is used as the input to a pair of parallel second-order filter sections that simulate two of the formants of the vocal cavity. For an [IY] sound, try a center frequency of 238 hz. This will be the center frequency of the first formant. 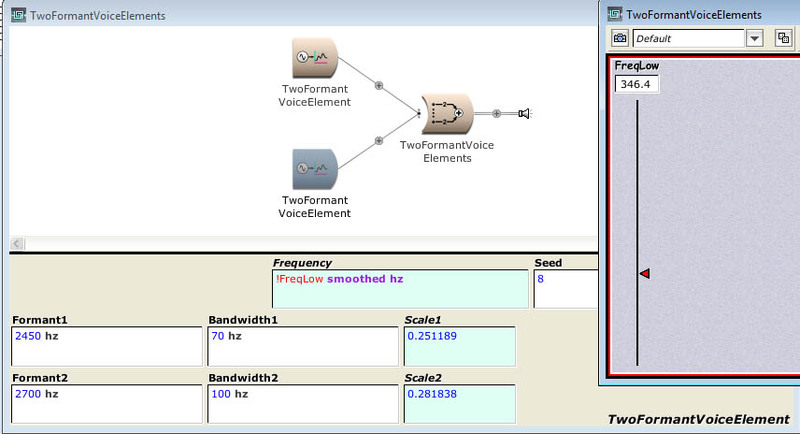 This is not the fundamental frequency of the TwoFormantVoiceElement but the center of an emphasized region of the spectrum. For an [IY] sound, try a a bandwidth of 70 hz. This is the bandwidth of the lower formant region. The narrower the bandwidth, the more "pitched" the formant will sound--also the more likely the the filter is to overflow. For an [IY] sound, scale this formant to 0.3. This controls the amplitude of the first formant. For the full amplitude use +1.0 or -1.0; any factor whose absolute value is less than 1 will attenuate the output. For an [IY] sound, try a center frequency of 1741 hz. This will be the center frequency of the second formant. This is not the fundamental frequency of the TwoFormantVoiceElement but the center of an emphasized region of the spectrum. 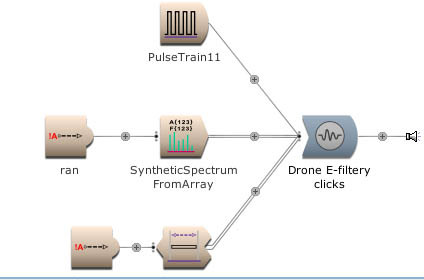 Synthesizes a filtered pulse train where the filter is based on the shape of the FormantImpulse and on the formant frequencies, amplitudes, and bandwidths that you supply in the Spectrum parameter (which is usually a SyntheticSpectrumFromArray Sound). This Sound is a collection of modes with optional filtering and/or distortion in the feedback loop. 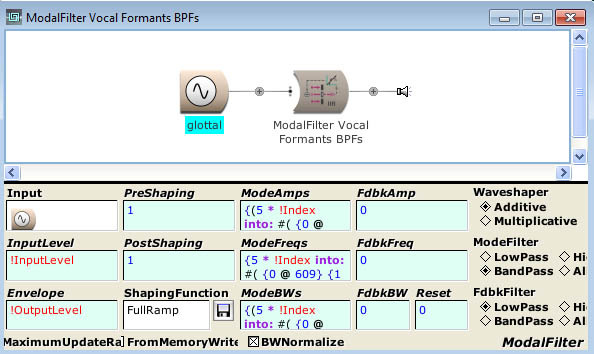 You can use ModalFilter to model objects like rooms, strings, air columns, membranes, pieces of metal or other objects for which you can obtain data on the mode frequencies, amplitudes and bandwidths. You can use subparts of this algorithm, for example, the modes without feedback or the feedback without filtering or distortion, or the feedback without the mode filters. (See the individual parameter help messages for the values that turn off various sections). You can create a changing waveform oscillator with the InputOutputCharacteristic by feeding a FullRamp oscillator into it. (Think of the FullRamp as the phase of the oscillator and the shaping function as the waveform of the oscillator). To change the height of the waveform, adjust a y value. To change the width of the waveform, adjust an x value. 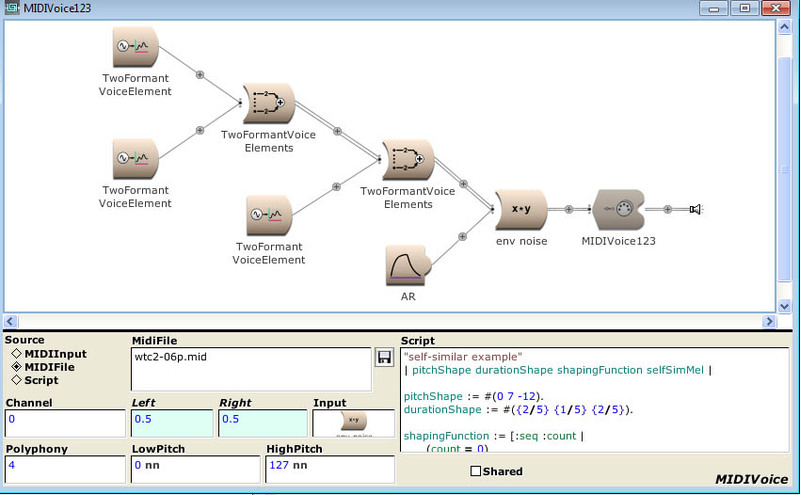 To adjust the smoothness of the waveform (from stairsteps to linear to spline curve) adjust the !Curve fader. Changing the Pulse Width, or Duty cycle of an oscillator. 60 controlled random duty cycles. 1st default state. After this random states as 'noise colours'. Outputs the product of its Inputs. If there are two, audio frequency inputs, this does ring modulation. If one of the Inputs changes at sub-audio frequencies and the other is at audio frequencies, the effect will be like applying an amplitude envelope to the Input that is at audio frequencies. Does nonharmonic frequency scaling of the input. Takes the input and does a 90 degree phase shift between the left and right channels at the frequency specified in the Frequency parameter field. Multiplies this by a QuadratureOscillator with sine in the left and cosine in the right. The resulting ring modulation gives you sum and difference frequencies but, because they are 90 degrees out of phase, the difference frequency is mostly cancelled out, leaving you with single side band modulation. The output of this module can be put directly into a QuadOscillator for single-sideband ring modulation. The left channel is the Input phase-shifted by 90 degrees. The right channel is the Input. 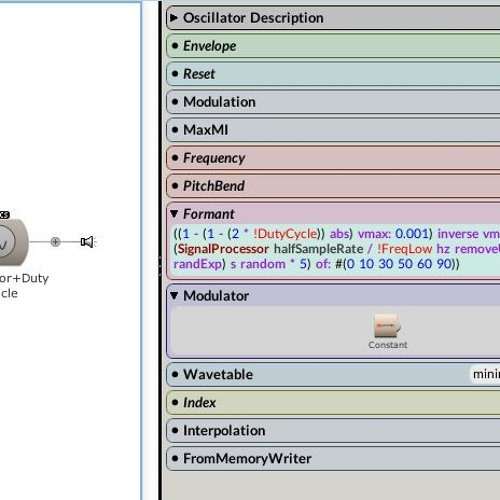 Delay through this module is ((numberTaps - 1)/ 2 + 1) samples. The larger the number of taps, the higher the quality of the phase shift (but the more processing time required and the longer the delay time through the module). Roland - just wanted to thank you for a cool and comprehensive post. I keep going back and forth about selling my Pacarana but every time I see a post like yours I convince myself I would be crazy to sell it. I don't get much time at all any more on the system but I am certainly going to power it up soon and go through your samples. Thanks again for the inspiration! Thank you Jcsveth, you're welcome. All synths, except candybar preset synthesizers, cost time to handle them. 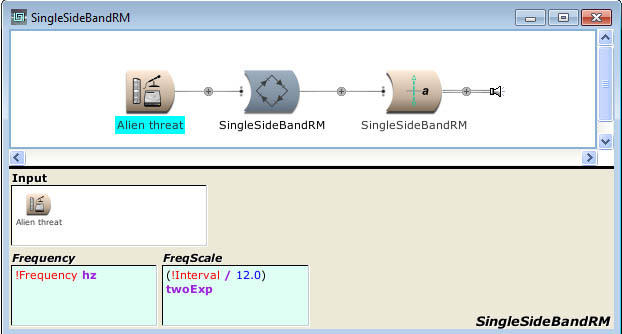 Take modular systems with their endless routing possibilities. Kyma can do both, simple synthesis and from that point you can go deeper. To rocket-science you can't even imagine. Creating music is always a time investment. I will post some more examples in short time. In the above posts, some SC files aren't shown. How much I tried to edit them. Very interesting to me, as someone who has heard of Kyma for years but never had my hands on it, or seen any patches described in detail. Thanks for sharing these, Roland! I've been stalking you and many other Kyma users for a few years, and I'm now just waiting on payment from my latest project before I drop money on a Paca! Sound Design is what pays my bills, so i'm super excited! Would getting the Paca, and *not* the Pacarana right away leave me disappointed? I figure I can always expand a Paca by purchasing a Pacarana later and setting up a little wormhole, and I plan on using the Paca as an intentionally separate environment for the sake of sound design/effects. Hey Roland, do you mind if I post examples based on some of the new sounds I've upload to the Kyma community or would another topic better? I was going to do something very much in line with your theme here: description of the workflow + audio examples. Btw, I notice in the one of the examples above, you have my old Omni Chorus sound in there. Just this weekend, I started on an update to that as part of trying to upload, improve, and re-upload stuff from the old wiki the new community library. These are some awesome examples. Which version do you own? I may have to make an exception for my "no new gear" rule. I missed this thread before... Definitely appreciate seeing this! 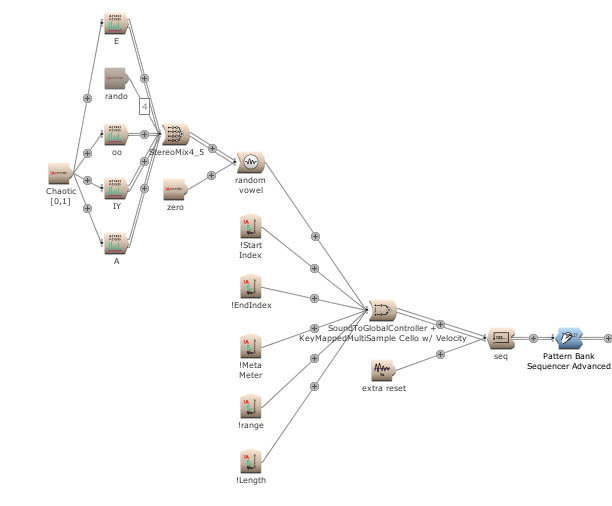 I've been interested in Kyma for a while, but it's hard to get clear examples of workflow. This is fantastic. I own Pacarana but have had a system since late 90s starting with a Capybara320 just shortly after it was released. Pretty sure Roland has a Pacarana as well. There was a question about Paca compared to Pacarana. It depends on how you use it. I rarely run out of DSP on the Pacarana but I used to all the time with the Capybara system so I jumped on the Pacarana. The only time I've run out DSP now is when I code something badly or have way too many voices. I think the Paca is a great system and would definitely give you enough. If you fall down the rabbit hole and want more, it is easy enough to upgrade. I have a Pacarana running here. Sometimes my demands are bigger than its DSP. But working around can be fun too. The new software is amazing. Carla & Kurt still updating the Kyma software/hardware with new tools. I will place some new examples here. Begin 90's I emulated the Pearl Syncussion Drum Synthesizer with Clavia's Nord Modular Synthesizer. Later I migrated this patch to the NMG2 platform. 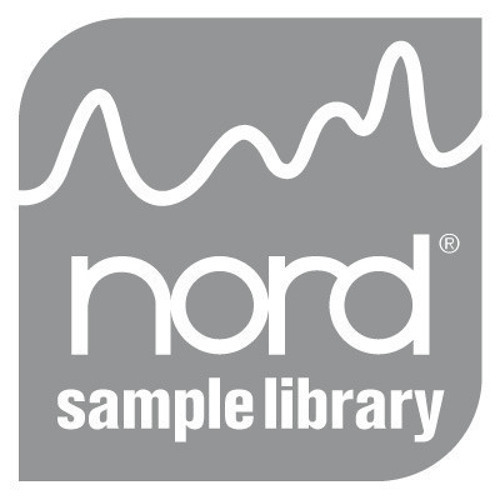 This sound file contain some of these samples processed on Kyma. Feel free, and others too, to post examples here. Just chiming in to say to thank Roland for these posts, and that I'd love to see more in this thread -- when I have a new Kyma patch worthy of dissection I will contribute, but for now, I am studying hard! 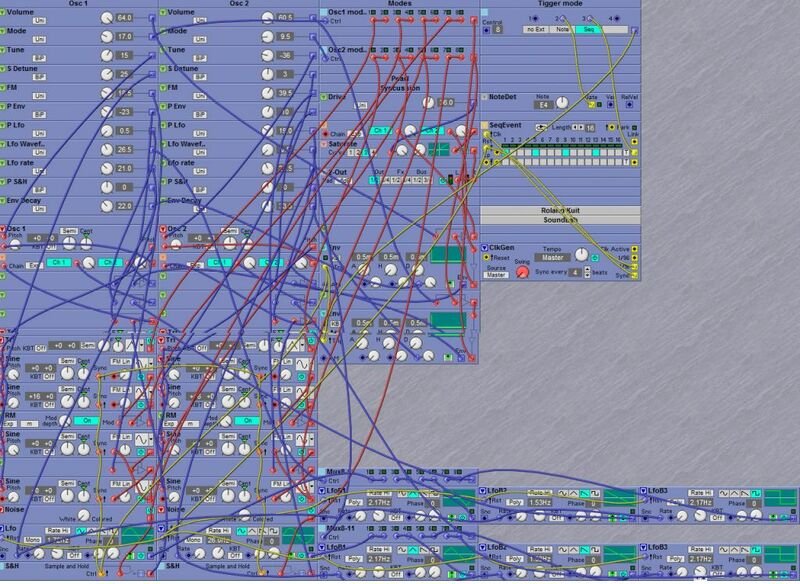 In Kyma it's possible to do old modular synthesis tricks. This is an ARP2600 trick to give the filter more bite. A bit extended.